If you are going to do a clean out or home improvement project, get a roll-off dumpster to throw all your waste in and have it hauled away. This will give you more time to focus on the project at hand without having to worry about how you are going to get all that stuff to the dump and deal with dump fees. Regardless of the size and nature of your project you can find a roll off container or dumpster to fit your needs. Most dumpster rental companies on Cape Cod offer several different sizes of roll-off containers and dumpsters. 10 yard, 15 yard, 20 yard, 30 yard and 40 yard roll-off containers and dumpsters are available on Cape Cod. Keep in mind that many companies that rent roll-off containers on Cape Cod do not take household garbage. If you have quite a bit of household garbage, you will probably need a trash collection service and not a roll-off dumpster. If you are looking to get rid of landscape waste like brush, stumps and leaves make sure you specify that. Most dumpster companies do not want mixed waste in their containers. Like household junk and landscape debris mixed in one container. You may need to order separate containers for different types of waste. How big is a __ yard dumpster? On most containers and roll-off dumpsters the top is open and there is a door at one end making it easy to load your refuse. Some waste collection companies also offer portable toilets for use on construction sites. They may also offer on site storage containers for temporary storage during construction or clean outs. There are restrictions on the disposal and transfer for disposal of certain hazardous and recyclable items at solid waste facilities in Massachusetts. (See the MA State Solid Waste Facility Management Regulations, 310 CMR 19.017). 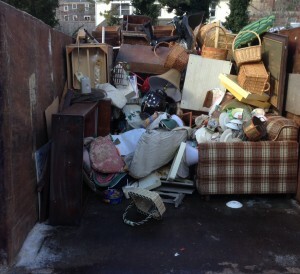 Need to get rid of junk in your attic, basement, garage, shed or storage unit? Get a Free, No Obligation Quote. Click Here.